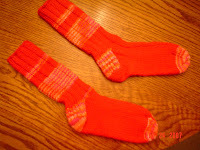 These socks were made with Bernant Softee Chunky in red and red, pink, and orange variegated yarn. I tried alternating the solid and variegated yarn at the top for the ribbing and even tried using the variegated yarn in the heel and toe. (Sorry, I guess the colors don't show up so well in the photo.) I just noticed that I have a variegated stripe going around the instep on one sock -- so they will be unique!! Oh well, I'm still learning. I don't think I quite have a handle on changing colors in the toe. I'll have to visit a yarn shop where I can get some advice in person or perhaps someone on the sock knitters group will tell me!